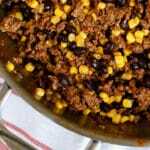 Ground beef seasoned generously with Mexican spices is tossed with black beans and corn to create a versatile "taco meat" that is perfect for tacos, salads, burritos, quesadillas, and nachos. Cook and crumble the ground beef, sprinkling with the spices as it begins to crumble, Drain any excess grease and add the beans and corn. Stir to combine. Continue cooking for 1-2 minutes, just to warm everything. Taste and adjust spices as needed. Serve immediately or let cool and portion into freezer safe containers. Enjoy! Don't hesitate to add more spices, if needed. The key to all the flavor in this taco meat is the generous amount of Mexican spices.